It is so easy to psychologically get into a muddle with things and (still) think that one is doing well. We get situated in a psychological morass without suspecting that that is the situation. We continue to feel that we are performing sufficiently. Self-deception is so very easy, so very possible (with dire consequences), yet few of us look deeply into it and investigate whether it is affecting us. In my blog, for instance, sometimes existing beyond the “self” or existing beyond the supposedly central “I” is sometimes discussed. Many people tend to shun such talk; it makes them feel less comfortable, less psychologically secure, less self-asserting. Ironically, however, it may be metaphorically like remaining in bed all day (under the sheets) to keep oneself “safe” and “unharmed.” However, all the while in such a situation, one is not getting the exercise and joy in life that is there (and the body ends up perishing sooner with many problematic issues). It is so easy to be duped in life… so easy to be misled. Miseducation has a lot to do with it, and miseducation is rampant in most societies. Learning to be a nurse or a carpenter is one thing (which is good), but many — if not most — of us are brought up and miseducated in ways to bind us to psychological mayhem. One thinks that one is separate from the fears that occur, for example; then one tries to control the fears from an (internal) distance. That very distance reinforces the concept of “I” that thinks that it is separate from the fears. Many fears are protrusions of thought/thinking about what the future might be; the concept of “I” (or “me”) is also a protrusion of thought/thinking. One protrusion thinks that it must control another protrusion; one conditioned reaction projects that it must control another reaction. However, there is a fundamental absurdity with this. Fear dissipates (fundamentally) not by pseudo-manipulation by a false process but by deep understanding and penetrating insight. The utter chaos, friction, indifference, and violence of our current society is a projection and reflection of the inner disorder within each one of us. Hate is not something that one merely has; it is what one actually is. When hate is a reaction (in one)… one is the hate… one is not merely something that has hate. Hate involves separation, friction, and distance… much like the separation, friction, and distance between the “I” (or swollen ego) that thinks that it is different (or apart) from the fears that take place. Many of us can transcend the muddle that we are in — that we exist as — and that takes understanding and insight… not mere internally deceptive effort. Don’t be bamboozled by false processes that were absorbed in (and “as”) the past. Thank you, esa! 🙂 It’s a shame that deception is so rampant in society these days! That’s a phrase that one never heard before! 🙂 Personally, “thinking” is perfectly fine and is a very useful tool. A lot of people, of course, over-use it and merely remain in the limitations of it. However, one cannot merely “will” to not do it — or control the mind out of it; there is no separate “controller” that is apart from thought/thinking; the thinker and the thought are one and the same. Any effort to move out of “thinking” merely extends that thinking (though the mind can deceive itself about the supposed “silence” that it attains). True silence exists when self-deception fully ends. Thanks much, Kym! 🙂 Sometimes one feels that one’s blog writings here have a semblance to someone talking to a wall. Woww Tom, wonderful and beautiful! 🙂 Amazing combinations of colors! Way back in my younger days, “Games People Play” helped me look at others and myself with fresh eyes. Today, I look around and observe that MANY are playing the hate game. And it’s addictive. The more they hate, the more they find TO hate. It feeds on itself. And it’s soooo nonproductive. Sad situation our society is in. Yes, Jazz! Locking up kids and permanently separating them from their parents and all kinds of hate crimes (in the U.S.)… and a big increase in antisemitism in Germany and other countries. People are regressing instead of flowering into something new and profound. You are so right… it is sad. Yes, as you precisely mentioned: “Instilling and continuously stroking fear and hate in people who don’t know how to think critically is a very sad truth of these times!” One feels that common sense and decency have a very uphill climb in these insane and Hitler-like times, unfortunately. You’ve perfectly stated our current society – nothing to be proud of for sure! 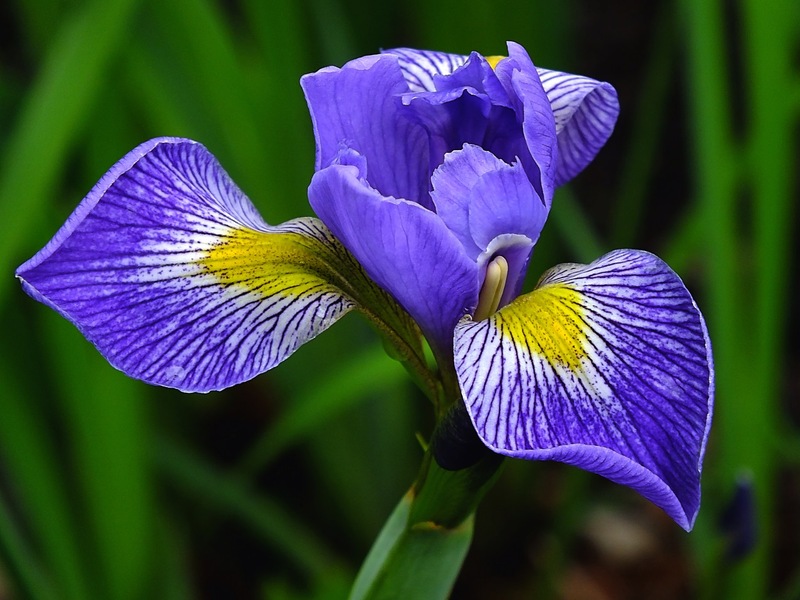 The iris rises above it all and blooms anyway – we may bloom too, but some our beauty and luster is gone now. Yes, Linda, nothing to be proud of for sure! My eyes have been tearing a lot with pondering the direction society is heading in. It’s a shame that the crass and heartless can dominate the minds of others so easily. People may still bloom too, but i feel that it will be only a few of us (with a real inner revolution taking place). I’ve tried (in a number of ways) to help regarding this (but most people are just not interested).